Harris & Ross Wilmslow Physiotherapy clinic is the flagship in the Harris & Ross group and has been based at Total Fitness in Wilmslow for the past 10 years. The clinic offers a wide range of services including physiotherapy, sports massage, hydrotherapy and podiatry. It is also one of the few places in the UK that delivers APOStherapy. Harris & Ross high performance sports management is also based at the Wilmslow clinic- with it’s own dedicated playground specifically for sports people, their sports injury treatment plus prehab/rehab and strength and conditioning. As part of this Harris & Ross Wilmslow also has Optogait technology in house, and Isokinetic Machines- which allow us to track performance and recovery using real data. Our patient base at Wilmslow is an eclectic mix of the local community, from children to 90 year olds, amateur and professional sports people and post operative patients. Jeff’s career is grounded in elite level sports. Having been Head Physiotherapist for New Zealand’s Rugby League and Football teams, he then travelled to the UK to reform the medical department at Manchester City’s Academy. From there he won a Premiership title as Head Physio to Sale Sharks, later taking post as a consultant where he co-ordinated the care of the entire medical department. Suzy comes from a background in private practice and has held the position of Head Physiotherapist at Stockport Rugby Union Club. She worked alongside Rob Harris at Manchester City, where she supported the young players at the City Academy and has assisted Jeff Ross at Sale Sharks. Darren was a military parachutist from 1989 to 1998, before leaving to pursue a career in strength & conditioning. After a short time in the USA, he began work with premiership rugby union teams and rugby league teams. In 2002, Darren began to work with Red Bull UK on various high performance projects with its athletes and eventually in 2008, he established and ran the Red Bull UK High Performance Programme until 2013. Darren was responsible for delivering and facilitating all high performance services to the vast range of athletes, from medical to strength & conditioning. In 2013, he was awarded ‘High Performance Team of The Year’, at the Innovation Enterprise Global Data Summit. 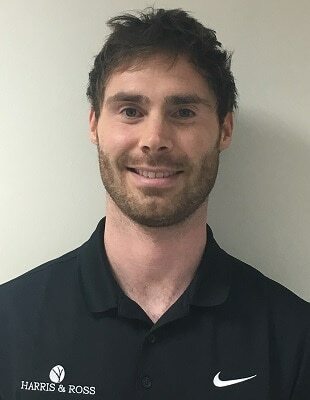 Prior to this, Dave has worked at Harris & Ross in our City Centre clinic, four years in musculoskeletal work for the NHS in Hyde; and initially completing his rotations at Wythenshawe Hospital for two years after graduating. Andy Renshaw holds a Bachelors degrees in Physiotherapy, Sport and Exercise Science (specialising in Exercise Physiology), and has an MSc in Musculoskeletal Physiotherapy. Andy has worked in a part-time capacity within Athletics and Rugby Union, and has 16 years of full-time experience as a Physiotherapist managing departments in Premier League Football. He commenced full-time employment at Bolton Wanderers FC in July 2002 and spent five years developing their Academy Medical and Sports Science Department, working with their First Team until 2009. During this time he was also the Clinical Director of his own Private Physiotherapy Practice in Manchester City Centre. In June 2009 he was offered the role of restructuring the Academy Medical Department at Liverpool Football Club, where he managed and developed that department until he was promoted by Jurgen Klopp to be the Head Of Physiotherapy for Liverpool FC, a role he held until November 2017. During this time Andy has also acted as a Consultant to the Premier League for several years and has presented at Elite National Performance Conferences, and published the world’s first Injury Audit following UEFA guidelines within elite youth football. To find out more and to book an appointment with Andy please click here. John graduated as a Physiotherapist in 2009 from Northumbria University. He started his career working as an intern at Bath Rugby Club. Since then he has worked part-time at Manchester City Academy, as well as in the NHS, and privately in the North-West of England and London. Graduating from the University of Salford in 2013 with a Bachelors in Physiotherapy, Chris started his career within the NHS and the Manchester United Centre of Excellence. Whilst working for the NHS, Chris was responsible for treating patients within a wide range of areas including; respiratory, orthopaedics, intensive care and musculoskeletal out-patients. Emma is a highly skilled musculoskeletal physiotherapist, with more than 15 years experience in a range of environments, including nearly 10 years at Harris & Ross. She has a proven track record of delivering specialised treatment regimes and rehabilitation to patients at all levels, with a particular focus on diagnosis and treatment of complex conditions and a return to full health. Working closely with elite level athletes on both injury treatment and training support, Emma has treated a multitude of sports people; from footballers to triathletes, rugby, squash and hockey players, plus many more. She has also provided physiotherapy support at a number of national sports events. After graduating with a 1st Class BSc (Hons) in Sport Rehabilitation in 2013, Sophie started work at Altrincham Kersal RFC as 1st Team Graduate Sport. She also spent a year working part time for Bolton Wanderers FC with their International Academy. As well as keeping up her work for Altrincham Kersal, Sophie has had the opportunity to work with the University of Manchester’s Men’s Rugby Union as 1st team Graduate Sport Rehabilitator and has also covered Stockport County FC Under 21s/ Development Squad matches. Katie is a sports massage therapist, who is currently studying for a degree in Sports Rehabilitation at Salford University, having acheived her BETC Level 3 diploma in Sport & Exercise Science in 2015 with a Triple Distinction. She has recently completed placements at Widnes Viking Rugby Club and Bury Football Club where she offered treatment for injured players, pre and post event massages, rehabilitation programmes, and oversaw rehab and training sessions. Katie is currently on placement at Bolton Wanderers FC where she is working with the first team and is heading to Wigan Warriors later in the year. Katie is also a qualified athletics coach and enjoys training focused on the mechanics of athletics including: sprinting, hurdling, jumping and throwing events working with a range of athletes from novices’ to elite. After having already completed a degree in Physiology in 2009, Thomas graduated from Salford Podiatry school in 2013 with a first class honours degree. Prior to getting his degree in 2013, he endeavoured to further his interest in biomechanics in the Netherlands where he studied a masters degree in Human Movement Sciences in Amsterdam. Our Wilmslow clinic is based at the Total Fitness centre, just off the A34 Handforth Bypass. We can be found on the first floor, near the main entrance, and there is a convenient lift that opens onto our reception area. Visitors will find plenty of parking available onsite, with a drop-off point near the main door. For more detailed instructions you can download our map, while if you would like further information about the services offered by Harris & Ross you can get in touch by phone or email using the contact details on this page. We have parking available on either side of the main entrance. Our clinic can be located on the first floor. Upon entering the building you will find a lift immediately on the left hand side, which will take you straight to our medical reception on the first floor. All treatment rooms are wide enough for wheelchair access and we have an accessible disabled toilet and shower should this be needed.